Wanted to SEO this post, so the title. But it is not a review of the product, rather my arguments on why we don't need such products in the first place. What is superstition? Believing in something blindly, without questioning. Many of us tend to believe whatever the advertisements claim. It’s worse when a TV ad talks about nutrition. I have been asked by family elders to give Complan/Horlicks everyday to my daughter because the ads say “taller, stronger, sharper”. Isn’t this superstition too? If it was TV for the previous generation, what’s the equivalent for our generation? Yes, social media. Who spreads such tall claims? Yes, the “so-called” influencers. Whatever respect I have had for food bloggers is declining rapidly with each passing day. Sometimes, I just want to unfollow all of them but then a thought pops up - “If I don’t follow, how would I know about the latest launches of packaged food brands, so that I can write about the healthier, environment-friendly alternatives?”. Sometimes, I want to respond to such popular food bloggers - “enge, ungalukku manasaatchiye illayaa?” (Loosely translated to “don’t you have self-conscience?”). A doctor with a specialization in nutrition writes about nutrition gaps in our diet and how we can fill such gaps by drinking a Tropicana fruit and vegetable juice. I used to be a big fan of her food blog in the late 2000s but the respect has gone down, thanks to these sponsored posts. She is just one example but there are many more food bloggers who have become a “thappattam” (announcer) for all these food brands. Friends, our education should help us to ask questions, instead of blindly following whatever is promoted in social media through these “influencers”. If we can’t ask, what’s the point of calling ourselves educated citizens? Aren’t we being fooled? 1) In the age of sophisticated, powerful mixers and juicers lined up in every modern kitchen counter, why do we need packaged juices in the first place? Can’t we make it ourselves? 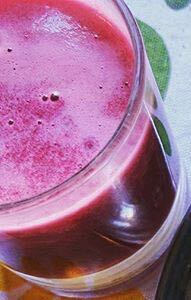 2) A fresh glass of apple, beetroot and carrot juice (ABC) can be made in 10 minutes with a simple mixer jar. Can’t we be self-sufficient? Do we need to *buy* these juices to fill nutrition gaps? 3) Let’s just accept, the packaged juice has no sugar and no artificial colour. What about preservatives? If there are none, how does the juice last for longer than a day? 4) After we buy and drink the pack, what happens next? We throw the pack and the plastic straw into our garbage bin, which ends up in landfills. Do we need such convenient packs that spoil the environment? I’m neither a social media influencer nor I’m promoting any brands here. My only intention is to spread awareness on such convenient, packaged food products that are bad for our health and for the environment. Chop an apple, a carrot and half a beetroot finely. Grind to a pulp using your regular mixer. Add a pinch of salt, cane sugar and lemon juice. You’ll feel refreshed and you’d have got your daily dose of iron and beta-carotene, without harming the environment. Your stomach will bless you for giving fresh juice, along with fibre. Any day best that preservative loaded juices. The nutrition too retained.